World War II was waged on land, on sea, and in the air over several diverse theaters of operation for approximately six years. The following essay is one of a series of campaign studies highlighting those struggles that, with their accompanying suggestions for farther reading, are designed to introduce you to one of the Army's significant military feats from that war. This brochure was prepared in the U.S. Army Center of Military History by Thomas A. Popa. I hope this absorbing account of that period will enhance your appreciation of American achievements during World War II. The Allies had begun their invasion of the Italian mainland in early September 1943 with the promise of a quick drive north, up the "soft underbelly" of Europe and into the German heartland. Yet nineteen months later, after hard fighting up the rugged mountainous spine of the narrow Italian peninsula, such goals still eluded the Anglo-American military leaders of the Mediterranean Theater. To be sure, long before April 1945 Rome had fallen to Allied arms and fascist Italy had been knocked almost completely out of the war. But in the interval France had also been liberated, and the Soviet Union had reclaimed almost all of its territory previously conquered by the once invincible German war machine. In 1944 the 15th Army Group, under Field Marshal Sir Harold R. L. G. Alexander, consisted of Lt. Gen. Mark W. Clark's U.S. Fifth Army and Lt. Gen. Oliver Leese's British Eighth Army. By midyear these forces had ended the stalemates on the Gustav Line, advanced up the Liri valley, captured Rome, and pursued retreating Axis forces north across the Arno River into the northern Apennines Mountains, on the very edge of the Po Valley, in the heart of northern Italy. departure to become the new 15th Army Group commander. Before Truscott took command, however, the Allied offensive in the northern Apennines had ground to a halt. Both Allied armies were exhausted. Personnel, equipment, and supplies had been siphoned off to support operations in northwestern Europe and elsewhere. The ensuing lack of resources, combined with the harsh winter weather, rugged terrain, and stiff enemy resistance, had left the Allies short of their immediate goal, the heavily fortified communications center of Bologna, a few miles to the north in central Italy. As 1945 opened the Allies still faced an organized and deter mined foe in Italy consisting of twenty-four German and five Italian fascist divisions. The Axis units were divided among the Tenth Fourteenth, and Ligurian Armies, all under Army Group C ant General Heinrich von Vietinghoff's command. Lt. Gen. Joachim von Lemelson commanded the Fourteenth Army, consisting of the L Mountain and XVI Panzer Corps, which opposed Truscott's Fifth Army in the west. Opposite the British Eighth Army to the east was the German Tenth Army, commanded by Lt. Gen. Traugott Herr, with the I Parachute and LXXVI Panzer Corps. The city of Bologna, still in Axis hands, constituted the boundary line for both sides. The majority of Axis troops in Italy were experienced veterans who belonged to relatively intact units. Although fairly well led ant supplied in 1944, they lacked vehicles, firepower, and air support, ant by early 1945 they were experiencing increasingly troublesome short ages in nearly every category of equipment. Yet the winter's respite had allowed them some opportunity to rest and to construct a defensive system in three lines that maximized the tactical potential of the rugged Italian terrain. Their first defensive line, along the northern Apennines, protected Bologna and blocked entry into the east-west Po Valley, about fifty miles farther north. The Fourteenth Army had built fortifications on steep mountain fingers that were anchored on higher ridgelines and consisted of mutually supporting positions to provide optimum observation and fields of fire. Although the mountain fingers widened as they neared the flat valley floors, the valleys themselves were fenced in by trees, hedgerows, and dikes, which restricted cross-country mobility and provided excellent cover. In addition, the Po River's southern tributaries emerged from the mountains to cross the valley floors, intersecting at possible routes of advance and serving as potential defensive positions. The Axis generals planned to anchor their second defensive line along the Po River itself. From its source in northwestern Italy, the Po meandered east to the Adriatic Sea. The river varied in width from 130 to 500 yards and was often bordered by levees which served as nature fortifications made stronger by field works on both banks. As in northern Europe, the towns and villages along the river would provide natural fortifications, while the more developed east-west road system would ease the resupply movements of the defenders. intricate system of trenches, dugouts, and machine-gun emplacements, was reminiscent of World War I. If stoutly defended it could be the toughest line yet encountered in Italy. Command, and by Germany's growing shortages in manpower and equipment. The top Axis commanders in Italy had repeatedly asked to withdraw from the Apennines to the stronger positions along the Po River before the expected Allied offensive. Permission was always flatly denied and Hitler's subsequent directives compelled local commanders to hold their positions until enemy action forced their retreat. Rigid adherence to this policy posed many risks for the defenders and made it difficult, if not impossible, to conduct organized withdrawals in the face of overwhelming Allied superiority in ground mobility and air power. As the Axis feverishly dug in, the U.S. Fifth and British Eighth Armies prepared for the coming battle. The Allied troops were exhausted from months of fighting in late 1944, and the first four months of 1945 were marked by intensive efforts to rebuild combat strength and morale. Front-line units rotated to rear areas for rest, relaxation, and training; replacements were worked into tired units; and damaged or worn equipment was replaced or rebuilt. Administrators and logisticians requisitioned, hoarded, and stockpiled equipment and supplies, especially artillery ammunition. Fuel pipelines were built, reconnaissance conducted supply points planned and bridging equipment collected. However, due to the shortages caused by the equipment and manpower demands of other theaters, this process took time. In the end Allied manpower and artillery superiority, critical in the rugged Italian terrain, was no more than about two or three to one. 85th, 88th, 91st, and 92d), the U.S. 10th Mountain and 1st Armored Divisions, the Japanese-American 442d Regiment, as well as the 1st Brazilian Infantry Division, the free Italian Legnano Combat Group, and the 6th South African Armored Division. The U.S. IV Corps in the west, under Maj. Gen. Willis D. Crittenberger, and the U.S. II Corps in the east, under Maj. Gen. Geoffrey Keyes, shared control of the ten division equivalents. On the Fifth Army's right flank was the British Eighth Army, commanded since 1 October 1944 by General Sir Richard L. McCreery. Containing the Polish 2d Corps and the British 5th, 10th, and 13th Corps, the Eighth Army controlled eight divisions from four different nations, as well as four free Italian battle groups and a Jewish brigade. By April 1945 their line extended from the Bologna area east to the Adriatic, ten miles north of Ravenna. attack, Operation SECOND WIND, to capture Massa along the Ligurian coast. Then, on 9 April the Eighth Army was to penetrate enemy defenses east of Bologna, drawing enemy reserves from the vital communications hub. On 5 April 1945, the U.S. 92d Infantry Division began its diversionary attack on the Ligurian coast. Bloodied by an Axis counteroffensive in December 1944 and again during an offensive in the Serchio River valley in February 1945, the now veteran 92d Division, preceded by air and artillery bombardments, attacked before dawn with the 370th Infantry and the attached 442d Regimental Combat Team. 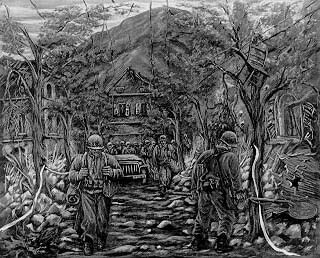 As troops of the 370th advanced through the foothills along the coastal highway toward Massa, they received heavy enemy fire and were halted. occupied by two of his comrades when an unexploded grenade bounced off his helmet and rolled toward them. Rising again into the withering fire, he dove for the grenade and smothered its blast with his body. By his swift and heroic action, he saved two of his comrades at the cost of his own life and was posthumously awarded the Medal of Honor. After several days of such savage fighting, the 442d captured Massa, and by 11 April pushed north to the famed marble quarries of Carrara. Here, determined enemy resistance stopped the American drive for over a week. To the east, on the Adriatic coast, Polish, Indian, New Zealander, and British soldiers of the Eighth Army surged forward on 9 April after a massive air and artillery barrage. For the next several days they engaged Axis forces of the 26th Panzer, 98th Infantry, 362d Infantry, 4th Parachute, and 42d Jaeger Divisions across the entire front, gradually pushing them north toward the vital Argenta gap, just west of the impassable Comacchio Lagoon. In spite of the stubborn resistance of German Tenth Army soldiers, the British 78th Division seized the Argenta gap on 18 April, thereby threatening to turn the entire Axis flank. The Eighth Army's successes set the stage for the Fifth Army's main effort. Planned for 12 April, the offensive was postponed when dense fog engulfed most Allied air fields. With conditions on 13 April no better, forecasts for the following day were equally dismal. On 14 April 1945, the IV Corps was still waiting for the word to advance, but the first weather updates that morning were gloomy. As the sun rose it began to burn the fog away, and fighter-bombers of the XXII Tactical Air Command became airborne. Shortly thereafter, at about 0900, Truscott ordered the Fifth Army's ground attack to commence. numerous strong points, the overlooking heights provided enemy soldiers of the 334th, 94th Infantry, and 90th Panzer Grenadier Divisions of the LI Mountain and XIV Panzer Corps with excellent defensive positions and fields of observation. Nonetheless, after forty minutes of air attacks and thirty-five minutes of artillery preparation, the 10th Mountain Division began its advance. Although the Americans quickly discovered that the Axis defenses were still largely intact, they doggedly pushed forward. machine gun in his arms and exchanged fire with the Germans until he had killed two and wounded three more. Then, with the enemy continuing to pour mortar and artillery fire on his company's position, Magrath again volunteered to brave the shelling to collect reports of casualties. While carrying out this last task, he was struck and killed by enemy fire, posthumously winning the Medal of Honor. With such soldiers, the 10th Mountain Division seized the basin and the hills to the north by the evening of the fourteenth, but its gains had been made at the cost of over 550 casualties. To the east, the 1st Armored Division had launched a two-pronged northward attack in the Reno River valley along Highway 64 and the adjacent heights. At 1750 hours the 81st Cavalry Reconnaissance Squadron began the offensive by storming the heavily defended town of Vergato, just west of the river. Within two hours the Americans controlled half of the town, but were halted by fierce enemy mortar and machine-gun fire that required them to engage in costly house-to-house fighting before resuming their drive north. West of the two attacking American divisions, the Brazilian Expeditionary Force also joined the fray. Early morning patrols had entered the town of Montese, west of the Pra del Bianco, without making contact with the 334th Division, but a larger force moving into the area later in the day encountered strong resistance from an alerted enemy, and a sharp firelight ensued. After a lengthy and bitter engagement the Brazilians forced the enemy to withdraw. For much of the next four days, 15-18 April, the IV Corps area was the scene of intense ground action as the 10th Mountain and 1st Armored Divisions slowly pushed northward, expelling Axis forces from Monte Pigna, Monte Mantino, Monte Mosca, Monte Pero, and the Reno River valley. As elsewhere during the Italian campaign, the fighting consisted of fierce small-unit actions that moved from ridgeline to ridgeline, and from valley town to valley town, accounting for heavy casualties on both sides. Yet American firepower superiority and aggressive infantry attacks slowly pushed back troops of the 94th Infantry and 90th Panzer Grenadier Divisions, XIVPanzer Corps, who fought stubbornly but futilely to halt the Americans. Although the IV Corps had advanced only six miles by 19 April, U.S. Army soldiers were beginning to detect signs that the first Axis defensive line in the northern Apennines was about to give way. pounded the fifteen miles of lines facing the II Corps held by the 65th Division and 8th Mountain Division of the XIV Panzer Corps and the 1st Parachute and 305th Infantry Divisions of the I Parachute Corps. An additional 200 medium bombers and 120 fighter-bombers of the XXII Tactical Air Command then hammered targets immediately opposite the II Corps in the Monte Sole area and in the Reno valley north to the town of Praduro, about halfway to Bologna. The 6th South African Armored Division and the U.S. 88th Infantry Division opened the ground offensive just after nightfall, moving toward objectives between Highways 64 and 65. By the end of the first day, the South Africans had gained control of Monte Sole, opening the way north up Highway 64 and the Reno River valley. Meanwhile, the 88th Infantry Division attacked enemy positions on the Monterumici hill mass and Monte Adone, the dominant terrain features west of Highway 65 and the key to Axis resistance in the area. Throughout the night and into the next day the 88th Division battered at the Axis defenses in small-unit battles reminiscent of the struggles for the Gustav and Gothic Lines the year before. By nightfall, however, both features remained in enemy hands. Farther east, the U.S. 91st and 34th Infantry Divisions attacked north along Highway 65 in the Savena River valley with similar results. The defending 65th Division had heavily fortified the ridgelines on both sides of the valley, and stiff resistance immediately stopped the American drive. On the morning of 17 April the Americans renewed their attacks across the II Corps front against a wavering but still determined enemy. Building on its previous gains, the 88th Infantry Division succeeded in taking most of the Monterumici hill mass, raising hopes of an imminent breakthrough in the II Corps area. To exploit a possible breach in the Axis line, Truscott released the U.S. 85th Infantry Division, then in Fifth Army reserve, to Keyes to assist with what he hoped would be the final northward push by the 6th South African Armored and the 88th Infantry Divisions. But simultaneously he redeployed the 1st Armored Division from the IV Corps' eastern flank to the west so that it could exploit any break in the Axis line toward Modena and northward. toward the Po. In the face of superior Allied air and ground forces, and with negligible reserves, the Germans had little chance of containing the emerging American breakthrough. and the 1st Armored Division dealing with the bulk of Axis forces in the Samoggia valley, the 10th Mountain Division advanced six miles due north, taking some 2,900 Axis prisoners and capturing Monte San Michele, just twelve miles short of Ponte Samoggia. Pushing three miles beyond the leading troops halted for the night to allow reserves and support elements to catch up. To the east, the 85th Infantry Division advanced against light opposition, keeping pace with the 10th Mountain Division. Farther east and closer to Bologna, the II Corps hammered at the enemy. By dawn on 18 April, Keyes' units had accelerated their advance, pursuing the rapidly withdrawing German forces. With the U.S. 88th Infantry Division pushing northwest against scattered resistance, the 91st Infantry Division unfurled the Stars and Stripes atop formidable Monte Adone-a visible confirmation that the stalemate on II Corps' front was finally broken. As Axis defenses cracked, the bulk of the Fifth Army passed west of Bologna and Generals Keyes and Crittenberger repositioned their units for the final push out of the Apennines. 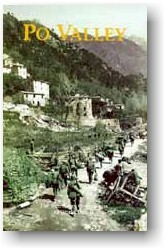 The turning point in the spring offensive came on 20 April, with both the Fifth and Eighth Armies in position to launch high-speed armored advances from the Apennines foothills toward the Po River crossings. Given the flat terrain and excellent road network in the Po Valley, unlike anything yet encountered during the Italian campaign, 15th Army Group orders now emphasized a faster-paced offensive where speed and mobility could be exploited to destroy surviving enemy forces before they escaped. The Italian campaign would become a race between Allied and Axis forces to reach the Po River first and the Alpine foothills beyond. Truscott ordered II Corps units to capture or isolate Bologna and to encircle Axis forces south of the river by linking with the Eighth Army at Bondeno, about twenty miles north of Bologna. To the west, along the coast, the 92d Infantry Division prepared to advance to La Spezia and then on to Genoa. In between he wanted the 1st Armored Division to mop up the remaining Axis forces in the foothills southwest of Ponte Samoggia, capture Modena, and drive for the Po. Meanwhile, the 10th Mountain Division, now pouring from the foothills, cut Highway 9 between Bologna and Modena, took Ponte Samoggia itself, and also moved north. Infantry Division advanced on both sides of Highway 65 to the southern outskirts of the city. By 21 April the Allies had completed the transition to a large-unit, fast-paced, and highly mechanized pursuit. The final units of Crittenberger's IV Corps emerged from the Apennines foothills with the 1st Armored Division on the left, the 10th Mountain Division in the center, and the 85th Infantry Division on the right. Truscott's first priority was to have Crittenberger expand his base in the Po Valley and cross the Panaro River north of Bologna before the enemy could reorganize there. On the left, the 1st Armored Division turned northwest along Highway 9, heading for Modena. In the center and on the right, a motorized task force of the 10th Mountain Division passed through Ponte Samoggia and advanced fifteen miles farther, seizing a bridge across the Panaro River intact. The rest of the division followed, while a steady stream of prisoners flowed to the rear. 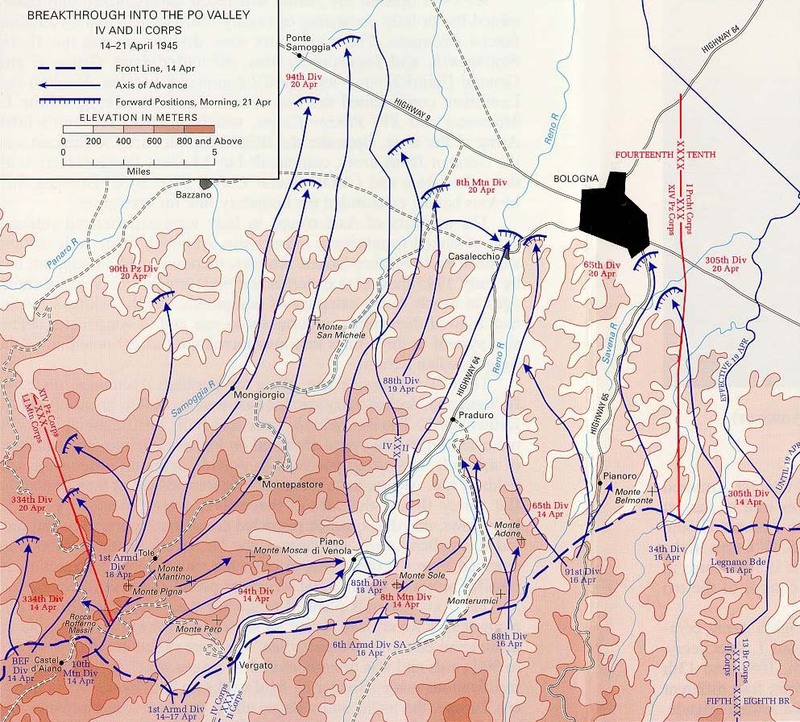 On IV Corps' right, the 85th Infantry Division relieved 10th Mountain Division rear detachments before crossing the Panaro River farther east. In the II Corps zone, Bologna fell to the U.S. 34th Infantry Division on the morning of 21 April, but General Truscott left the city to his Italian troops and sent the 34th west toward Modena. By reinforcing the IV Corps' left flank, he hoped to isolate enemy divisions still retreating from the northern Apennines and to deny them Po River crossings west of the 1st Armored Division. Attaching the 34th Division to the IV Corps, he instructed Crittenberger to put it astride Highway 9 between the 1st Armored Division and the Brazilian Expeditionary Force. Subsequently, the 34th Division reached Modena on 23 April and continued its attack northwest along Highway 9 toward Reggio, ten miles farther. Meanwhile, the 6th South African Armored Division led the II Corps' advance to the Panaro River and on to the Po, with the U.S. 88th Infantry Division mopping up the rear areas of Axis stragglers. On their right, the 91st Division skirted the western outskirts of Bologna, captured the airport, and continued north, rapidly approaching the Panaro. By dawn on 22 April the entire Fifth Army was well into the Po Valley. On the right flank, Axis forces attempted in vain to prevent the juncture of the Fifth and Eighth Armies, desperately trying to buy time for small detachments of their comrades to escape. But the Allied onslaught, now moving at full speed, quickly swept aside the hasty defenses erected by the 1st and 4th Parachute Divisions, overwhelming and annihilating numerous Axis rear-guard detachments in the process. Although the majority of the Po River bridges were destroyed, the U.S. 85th Infantry Division, like other fast-moving Fifth Army units, had been able to take many spans south of the Po intact, such as the Panaro River bridge at Camposanto, eleven miles north of Ponte Samoggia. Early on 22 April, fearing efforts of enemy rear-guard units to destroy the span, a sergeant from the division's 310th Engineer Battalion quickly plunged into the river, cut the demolition wires under enemy fire, and saved the structure from destruction. Once across, the 310th repelled an enemy attempt to retake the bridge and to hold the town. 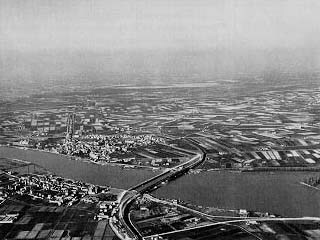 As one regiment cleared Camposanto and secured the span, another swung to the left, crossed the bridge seven miles south at Bomporto, and quickly covered the intervening twenty-four miles of territory, arriving at the Po River just before noon on 23 April 1945. The division then cleared the south bank, capturing hundreds of prisoners and much equipment in the process. Later in the day a westward shift of corps boundaries caused the 85th Division to relinquish some of its territory to the 88th Division, which had only left the Panaro River early that morning. The 85th then prepared to cross the Po River in force the next day. By 24 April the entire Fifth Army front had reached the Po. In the west, IV Corps units advanced west, northwest, and north, pushing forward bridging equipment for an offensive across the river. In the 10th Division area, fifty M-2 assault boats enabled the unit to begin ferrying troops across at noon. Air bursts from German artillery caused some casualties, but enemy actions failed to significantly delay the crossings here or elsewhere. Once on the far bank, the 10th Mountain quickly secured its bridgehead. By 1800 hours two regiments were on the far bank, with the division's third regiment crossing during the night. To the east, British Eighth Army units were within miles of the Po River by nightfall on 23 April, with the British 6th Armored Division at Bondeno, the 8th Indian Infantry Division ten miles farther east, moving through Ferrara, and the British 56th Infantry Division nearing Polesella, another ten miles to the east. The Italian Garibaldi Combat Group, soon to be joined by the Italian Cremona Battle Group, was closing on the Po River delta. on the left. At noon on 24 April, the 88th crossed the Po River at two spots against patchy resistance, followed the next day by the 91st in the center and the South Africans on the corps right wing. Meanwhile, as the 10th Mountain Division awaited the completion of heavier spans across the Po, other IV Corps units drove due west. On the IV Corps' left, the Brazilian Expeditionary Force protected the flank of the 34th Infantry Division, which reached Reggio, about fifteen miles west of Modena, early on 24 April. Above Modena and Reggio, 1st Armored Division task forces along the Po River's southern bank blocked all remaining escape routes. The division now prepared to put armored elements across the Po in the 10th Mountain Division's zone to protect the flank of its projected advance north into the Alpine foothills. river as quickly as possible and press the attack. He wanted the Fifth Army to shift its advance northwest toward Verona, about sixty miles above Bologna in the Alpine foothills. Its capture would deepen the rupture between the German Fourteenth and Tenth Armies, block escape routes to the Brenner Pass, and breach the Adige Line before it could be fully manned. Lack of bridging threatened to delay his plans. With no permanent spans surviving Allied air bombardments, a variety of amphibious craft, rubber rafts, wooden boats, and ferries were pressed into service to carry men and light equipment across the river. But heavy equipment had to await the construction of pontoon bridges. Since 15th Army Group plans had assumed that II Corps would be first to reach the river, the Fifth Army now had to push additional bridging for the IV Corps forward on already overcrowded roads. 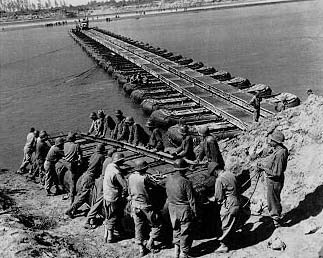 Nevertheless, through the efforts of Army engineers, pontoon and treadway bridges spanned the river within two days of the first crossings. Over the next three days, 24-26 April, Fifth Army forces erupted from their Po River bridgeheads and split the Axis forces in Italy. In the center, Fifth Army divisions raced for Verona. The 10th Mountain Division started north after midnight on 24 April, and by 0945 hours the next morning had advanced twenty miles to the airport at Villafranca, just southwest of Verona. On its right, the 85th Division moved from the Po River shortly before noon on 25 April, stopping within ten miles of Verona by nightfall. Only slightly farther east, the 88th Division also started north early on 25 April, moving by foot, jeeps, captured vehicles, and bicycles, and covering the forty miles to the outskirts of Verona in just one day. Operations on the Army's flanks continued apace. On the left, the Brazilians and the 34th Infantry and 1st Armored Divisions pushed west and northwest along Highway 9 toward Piacenza on the Po River, fifty miles west of Reggio. On the right the U.S. 91st Infantry Division also began its advance north from the Po, with the South African armor on its right, heading toward the Adige River town of Legnago, ten miles farther. Verona fell on 26 April 1945 as three American divisions converged on the city. The 88th Division secured the town at daybreak after a vicious night battle. Just after dawn the forward elements of the 10th Mountain Division roared into town, followed two hours later by the 85th Division. The seizure of Verona now brought the Fifth Army up to the final Axis defensive line in Italy, fully prepared to implement Phase III of Operation CRAFTSMAN. 1,000 to 5,000 yards. Yet, as imposing as it was, the Fifth Army's rapid advance had not allowed the enemy to fully man the defenses. Even if the time had been available, however, the Axis now lacked the materiel and manpower to organize a cohesive barrier. Fifth Army orders for the final phase of operations emphasized blocking the retreat of enemy troops south of the Alps. The Allied advance from this point more closely resembled a tactical march than a combat operation as most Axis units had disintegrated into small groups of harried soldiers retreating as best they could under intense Allied pressure. Therefore, after the IV Corps had secured Verona, General Truscott decided to send the II Corps northeast to help the Eighth Army in its drive to capture Padua, Venice, and Treviso. The II Corps' 88th Division crossed the Adige River at Verona on 26 April and prepared to move northeast about twenty-five miles to Vicenza. About twenty miles to the southeast, the 91st Division crossed the Adige at Legnano, securing the 88th Division's right flank. Generals Truscott and Keyes personally observed the 91st Division's passage over the Adige, concerned with the level of resistance encountered. If the crossing went uncontested, both men reasoned, it would show that the enemy was more interested in surviving than in making a stand from their prepared positions on the Adige Line. The American generals soon had their answer. Although the soldiers of the 91st were harassed by sporadic German artillery fire, the division crossed largely unopposed by any organized, coherent force. Meanwhile, to the right of the 91st Division, the 6th South African Armored Division advanced in the area between the Adige and Po Rivers, stretching out to Eighth Army units farther east and encountering equally weak resistance. Truscott now directed IV Corps units to seal the Brenner Pass in the north and destroy the Ligurian Army in the west. Moving quickly, the 10th Mountain Division's lead element, Task Force Darby, commanded by Col. William O. Darby of Ranger fame, left Verona on 26 April for nearby Lake Garda, where it soon worked its way up the eastern shore. On the 10th Mountain Division's right flank the 85th Division moved uncontested through the Adige Line north of Verona and went into Fifth Army reserve on 27 April. 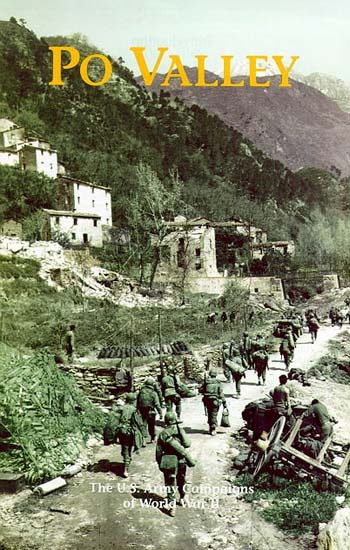 Italian Riviera, north of La Spezia, the soldiers of the U.S. 92d Infantry Division encountered only slight opposition as they swept up the coastal highway toward the port city of Genoa. As the lead elements of the division entered the city without opposition on the morning of 27 April, they discovered that the 4,000-man Axis garrison had already surrendered to Italian partisans the day before. Even as Fifth and Eighth Army units spread across northern Italy, secret negotiations to end the fighting between the Germans and Allies had begun to produce results. Underway since February, through the efforts of Italian and Swiss middlemen, they had been conducted primarily by Allen Dulles, the U.S. Office of Strategic Services agent in Bern, Switzerland, and Lt. Gen. Karl Wolff, the senior SS officer in Italy. Wolff, and later General von Vietinghoff, hoped to gain either the cooperation or the acquiescence of the western Allies for a continuation of Germany's war against the Soviet Union using Axis forces then engaged in Italy. Although neither Dulles nor Allied military leaders shared or even seriously considered Wolff's goals, they were interested in any possibility of ending the fighting in Italy without further bloodshed. A series of formal secret negotiations thus opened between the western Allies and Wolff's representatives in March and April. With the overwhelming success of Allied offensives everywhere robbing the Axis negotiators of any remaining bargaining power, German emissaries arrived at the 15th Army Group headquarters in Caserta, Italy, on 28 April to arrange a cease-fire and the unconditional surrender of the remaining Axis forces south of the Alps. They signed the appropriate documents at 1400 hours the next day and agreed to a cease-fire along the entire Italian front at 1200 hours on 2 May 1945. The devastating impact of the Allied offensive in April, however, had so shattered Axis communications and unit cohesion that the 15th Army Group agreed to withhold announcement of the cease-fire for three days, until late on 2 May, to provide enemy commanders the opportunity to notify their scattered units. In the meantime, the fighting continued. 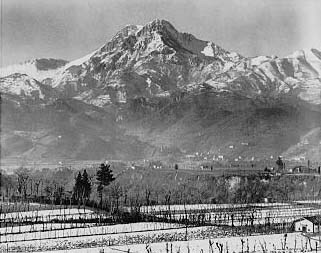 To the north the 10th Mountain Division continued to advance up Lake Garda's eastern shore, through the Alpine valleys leading to the Brenner Pass, the narrow defiles often blocked by last-ditch enemy rear guards. On 30 April, in response to reports that Benito Mussolini and other top Fascist officials were in a villa on the western shore, elements of the division crossed the lake to discover that their intelligence was false. Indeed the Americans soon learned that Communist partisans had executed Mussolini near Lake Como on 28 April, his body later being strung up by its heels on the Piazzale Loreto in nearby Milan. The American 10th Mountain troops reached the northern end of Lake Garda on 30 April, where Colonel Darby was killed by a random enemy artillery shell, just days before the end of hostilities. 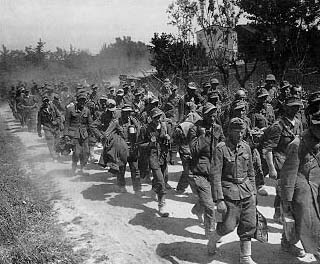 By the time of the final surrender on 2 May, the division had taken the towns of Riva, Torbole, and Nago, and was ready to advance into the Alps. Immediately south of the Alps, the 1st Armored Division continued to drive westward on 27 April, meeting Italian partisans from Milan who reported that they had already liberated the city, a fact U.S. troops confirmed two days later. On the afternoon of 30 April General Crittenberger and a composite command representing the entire IV Corps entered Milan, the largest city in northern Italy. In the meantime, the 1st Armored Division had moved west and southwest of the city, clearing small pockets of resistance and reaching out twenty miles farther west to the Ticino River by 2 May. Behind it, the 34th Division continued its clearing operations until it relieved the 1st Armored Division north of Milan, sealing off any Axis elements still attempting to withdraw north. South of Milan, the Brazilian Expeditionary Force bottled up the 148th Grenadier and Italia Bersaglieri Divisions on 28 April. On the following day the German commander surrendered; during the next twenty-four hours the Brazilians collected over 13,500 prisoners. 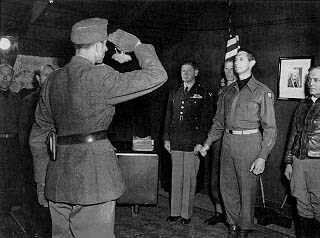 By 1 May clearing operations had ended, and a Brazilian task force joined the 92d Division at Alessandria, forty-five miles southwest of Milan, while the Japanese-Americans soldiers of the 442d Regimental Combat Team entered Turin, about fifty miles farther west, later that day. By 30 April the last organized Axis force in northwest Italy, the Ligurian Army, composed of the German LXXV Corps and the Italian Corps Lombardia, capitulated. For the next forty-eight hours, as the appropriate orders trickled down from the headquarters of what remained of Army Group C, the Ligurian Army's subordinate units surrendered piecemeal to IV Corps troops. in bitter house-to-house fighting before moving farther north, stretching out along Highway 11 between Verona and Vicenza. There they captured thousands of retreating enemy soldiers before sealing the last escape route north. On the last day of April, Truscott transferred the 85th Infantry Division from IV to II Corps, and on the following day both the 85th and 88th Infantry Divisions beta northward advance, moving along the Piave River toward the U.S. Seventh Army moving south from Germany, a juncture accomplished on 4 May. Elsewhere, the 91st Infantry and the 6th South African Armored Divisions protected the flank of British Eighth Army forces driving north and northeast, the latter reaching Trieste where they joined Tito's Yugoslavian Communist partisans on 2 May. For the Allied armies in Italy, the Po Valley offensive climaxed the long and bloody Italian campaign. When the spring offensive opened, it initially appeared that its course might continue the pattern of the previous months and battles in Italy, becoming another slow, arduous advance over rugged terrain, in poor weather, against a determined, well-entrenched, and skillful enemy. However, by April 1945 the superbly led and combat-hardened Allied 15th Army Group, a truly multinational force, enjoyed an overwhelming numerical superiority on the ground and in the air. On the other side, Axis forces had been worn down by years of combat on many fronts; they were plagued by poor political leadership at the top as well as shortages of nearly everything needed to wage a successful defensive war. By April 1945 factors such as terrain, weather, combat experience, and able military leadership, that had for months allowed the Axis to trade space for time in Italy could no longer compensate for the simple lack of manpower, air support, and materiel. By the end of the first two weeks of the campaign both sides realized that the end of the war in Italy was in sight, and that all the Allies needed to complete the destruction of Axis forces was the skillful application of overwhelming pressure, a feat largely accomplished within ten days, by 2 May 1945. By the time of the cease-fire in Italy, the U.S. Fifth Army had been in continuous combat for 602 days, well over twenty months, far longer than any U. S. field army during World War II. During the entire Italian campaign, Allied losses had exceeded 312,000, of which 60 percent, or about 189,000, were sustained by Fifth Army units. Of the total losses, 31,886 were killed, including 19,475 Americans, the remainder of the dead being British and Commonwealth troops, Brazilians, Poles, Frenchmen, free Italians, and members of the Jewish brigade. German losses in Italy were estimated at over 434,600, including 48,000 killed in action and over 214,000 missing, the majority of the latter presumed dead.